It’s Christmas cookie time! My girlfriends and I are doing a cookie exchange; everyone bakes enough cookies for the group and then gets to take home a mismatch of everyone else’s magical creations. I’m literally going to have enough cookies to bring my husband and entire family into the New Year – probably Valentine’s Day if they’d last that long. I have a few cookie recipes up my sleeve, but I’ve also reached out to fellow co-workers, friends and scoured a few blogs for new recipe ideas. Here is my little recipe book of Christmas/holiday cookies for you to enjoy. Merry Christmas, Happy Hanukkah, Happy Holidays! Share your recipes, too! In a medium saucepan, melt the two sticks of butter over low-medium heat until fully melted. Add peanut butter to saucepan and stir until melted (using a wooden spoon or spatula). Remove saucepan from heat and slowly add the entire bag of powdered sugar until all sugar is incorporated; your mixture will thicken. Pour fudge into an ungreased 8×8 (or larger pan for thinner pieces) and refrigerate for an hour (*see optional chocolate topping). Once the fudge is hardened, cut into small squares and serve. *Optional: For a truly authentic Reese Cup flavor, melt 1 cup of milk-chocolate or semi-sweet chocolate chips and drizzle or spread over the fudge before refrigerating. Directions: Heat oven to 400 degrees; Mix butter, granulated sugar, vanilla; add flour and salt; chill; roll into one inch balls; and bake for 10-12 min. Roll cooked snowballs in 1/2 cup of powdered sugar until well coated. Enjoy! Preheat oven to 350 degrees, with racks in upper and lower thirds. Combine flour, baking powder, and salt. In a large bowl, using a mixer, beat butter, granulated sugar, and 1/4 teaspoon peppermint extract on medium-high until pale and fluffy, 3 minutes. Beat in egg, then flour mixture on low. Stir in chocolate chips. Roll dough into 1 1/2-inch balls and place, 2 inches apart, on parchment-lined baking sheets. Bake until edges are lightly golden, about 12 minutes, rotating sheets halfway through. Let cool on sheets on wire racks 5 minutes, then transfer cookies to racks and let cool completely. Stir together confectioners’ sugar and enough cream to make a spreadable glaze (if you like a strong mint flavor, stir in up to 1/4 teaspoon extract). Spread a thin layer of glaze on top of each cookie and sprinkle with candies. Let dry completely on racks. Cook’s Note: Store in airtight containers, up to 3 days. Whisk flour, cornstarch, baking powder, and salt in a medium bowl. 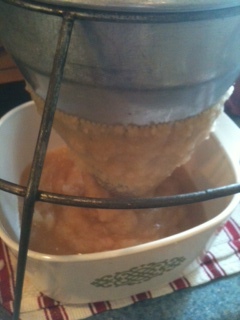 Put butter and granulated sugar into the bowl of an electric mixer fitted with the paddle attachment. Mix on medium-high speed until pale and fluffy. Mix in yolks, lemon zest, and vanilla. Reduce speed to low, and gradually mix in flour mixture. Shape into a disk; wrap in plastic. Refrigerate until firm, about 1 hour. Preheat oven to 350. Transfer dough to a lightly floured work surface. Roll out to a generous 1/8 inch thick. Using a 2 1/2-inch round fluted cutter, cut out wreaths. Reroll scraps, and cut out. Cut out centers of wreaths using a 7/8-inch round cutter. Space 2 inches apart on baking sheets lined with parchment paper. Refrigerate until firm, about 15 minutes. Bake until just golden, about 12 minutes. Let cool completely on wire racks. Stir together confectioners’ sugar and lemon juice in a small bowl. Dip surface of each cookie in icing, and sprinkle with pistachios. Let set on wire racks. 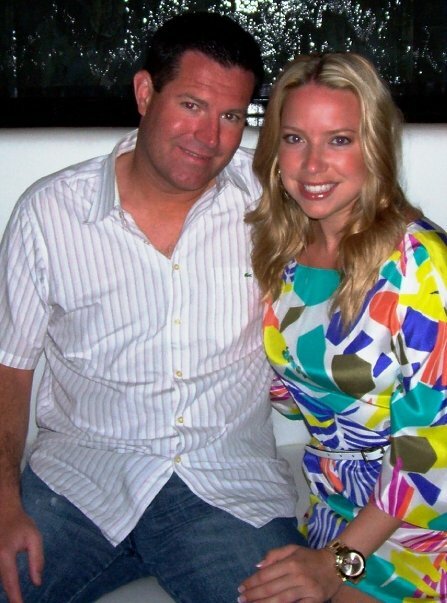 I found this divine recipe on a blog called “The Nest.” Who doesn’t LOVE bacon!? Now you can have it in a cookie! These cookies spread. Be sure to leave plenty of space. We placed two rows of four on our standard baking sheets. Use REAL maple syrup. The taste of it and the other brown, sugary liquid stuff do not compare. You can bake two sheets at once. At the halfway point, just be sure to rotate tray from top to bottom and from front to back. The cookies must cool on the paper because they are still quite soft in the middle when hot. After the sugar cools and does its magic you will find them simple to peel from the paper. Cut bacon in half lengthwise. Cut strips into ½ inch pieces. Cook bacon and strain over a small bowl to reserve drippings. Place drippings in the freezer to cool slightly. In a medium sized bowl, whisk together flour, salt and baking powder. Set aside. Place butter in the bowl of your mixer. Beat on medium high to make smooth for about 30 seconds. Add cooled bacon drippings. Beat for 30 seconds more. Add both sugars. Beat on high speed until light and fluffy (about 3 minutes). Add eggs one at a time mixing until fully incorporated after each. Add syrup and mix until fully incorporated. With your mixer on lowest speed, add dry ingredients gradually mixing only until just incorporated. Add oats and bacon pieces and mix just until combined. Using a medium scoop, place dough on parchment lined sheets at least 2 inches apart. Bake until lightly browned on the edges but still soft in the middle (about 18-20 min.) Rotate trays at about 9 minutes. Cool cookies completely on parchment paper. When cooled, peel cookies from paper and store in an airtight container. Please share your recipes for delicious Christmas/Holiday cookies here for our readers. 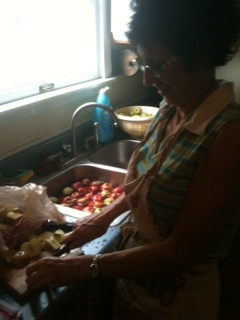 How to make Homemade Applesauce in Six Simple Steps: My Grandma’s Recipe! Apple season is here! On farms across the Midwest to your neighborhood markets, apples are bursting on the scene, making their final appearance before winter. The orchard on our family farm near Oxford, Ohio is a colorful bouquet of deep ruby red honeycrisp apples, neon green Granny Smiths, Ginger Golds and beautiful multi-colored Paulia Red apples. 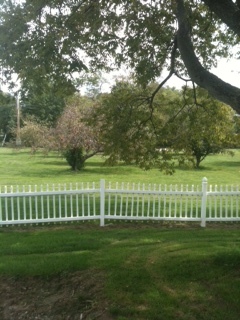 It is a beautiful thought to know that my grandfather planted the orchard using tiny seeds of his favorite fruits. Today, years after he has left the earth, we are still reaping the “fruits” of his labor. 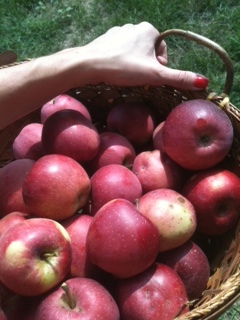 It only took me about 15 minutes to pick a basket of apples. 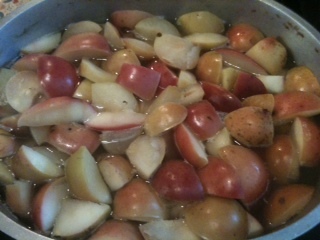 This batch yielded about 5-7 baggies of applesauce. With the diverse apple, there are endless recipes to be made; warm cobblers and pies to cinnamony sauces, chunky chutneys, and more. Harvest season has always marked a special moment in my family’s life. 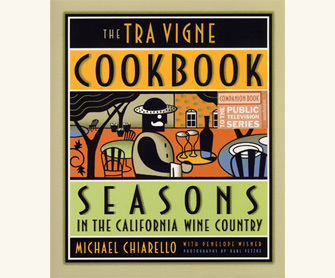 A time when the Italian women come together in grandma’s kitchen with aprons, bushels of (insert fruit/vegetable name here), canning products and stories from the past – to spend a day picking, peeling, boiling, mashing, grinding, flavoring and canning home-grown flavors that would last through the winter. My grandma’s applesauce recipe, which I call Sunset Acres Applesauce (my mother’s version is Sunflower Applesauce), is incredibly simple and it makes a great gift for friends, family and other loved ones. *A special thank you to my mamma bear, Jayne, for making a huge batch of applesauce with me and passing on the family recipe. Bushel of mixed orchard apples: If you are making enough sauce to harvest for the winter (or give to friends) buy a bushel of apples (preferably Red Delicious, honeycrisp, Fuji) – mix them up and get them from an orchard or real farmer’s market :). A bushel is about 40 lbs. of apples. 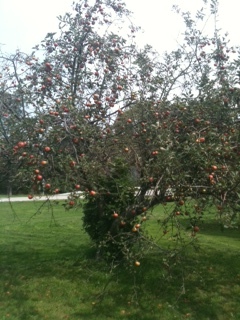 According to http://www.pickyourown.org, you’ll get about 12 to 16 quarts of applesauce per bushel of apples. Count on 12 or 13 quarts per bushel. 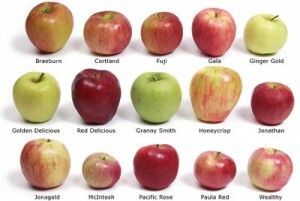 More on apple measurements below. 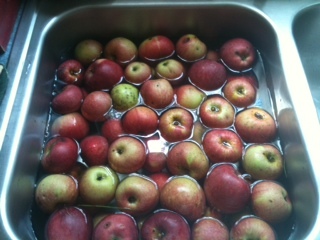 Step 1: Wash and slice apples into manageable chunks, keeping skins on (the skin will be separated in the sieve. Remove the core and seeds. Step 2: Boil water in large wide pot at a simmering boil. Turn the heat down and place apple slices in hot water for 20-25 minutes or until the apple skin appears to be separating from the apple flesh. The color of the apples will turn from a crisp/ripe apple to a brackish/brown color when ready – they should be soft and mushy if you stick them with a fork. 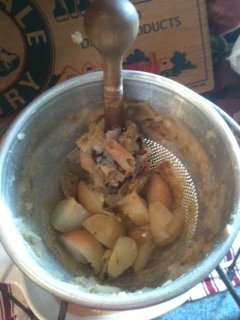 Step 3: Add the boiled apples to sieve and churn, placing a ceramic dish beneath the sieve to catch the sauce. 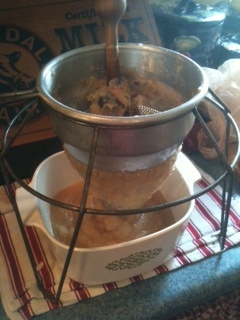 stir the handle of the sieve to separate the flesh from the skin with a bowl beneath to catch the sauce. 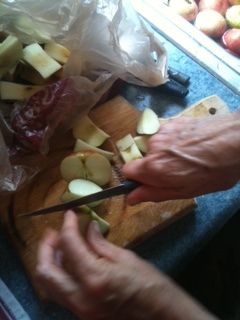 Step 4: Flavor the apples. First, place the ceramic pan with the sauce over low heat. 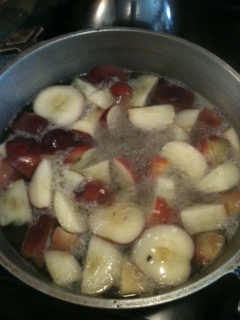 Using a wooden spoon, mix in your ingredients (metal adds bad taste when you mix with acidic apples). 1 tsp. of cinnamon (more/less or none). 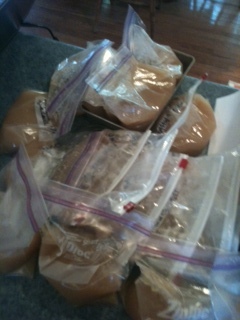 Step 5: Remove applesauce from heat and begin to ladel into the plastic freezer baggies. I use about 5-7 scoops/ladels per baggie. 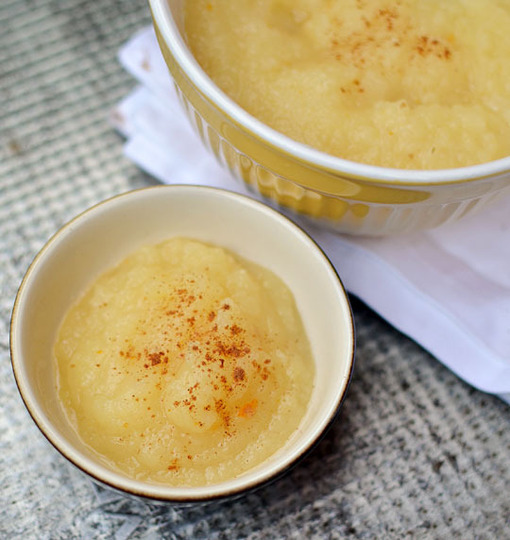 The applesauce only lasts a week once removed from a freezer, so use portion sizes according to your needs. Step 6: Toss the baggies into the freezer and when you are ready to enjoy them, simply defrost and eat within a week. You can serve your applesauce warm with any meal or pour over ice cream as a topping. Either way your family and friends will enjoy this homemade delicious treat. Salute! 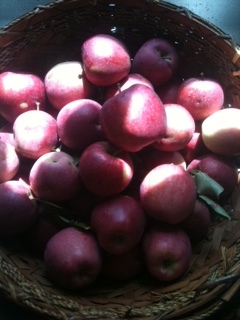 How Many Apples in a Pound and How Many Apples in a Bushel?